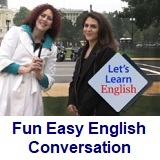 ﻿ Fun Easy English - new american english standard conversation Voice of America VOA learning English for intermediate introduction. 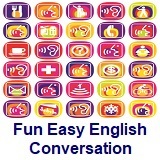 This is a collection of VOA conversation lessons for intermediate students. Each lesson has a conversation video, a video script, audio listening practice, and a new word section. 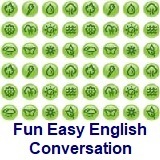 These are all of the Let's Learn English Lessons for intermediate students. 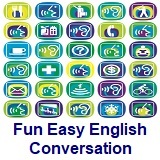 There is a total of 30 lessons covering important English conversation topics. Lesson 13 - Save the Bees! Lesson 15 - Before and After Lesson 16 - Find Your Joy! Lesson 24 - I Feel Super! These are activities from the beginner lessons in PDF format. These are on printable pages. These are very useful as a good review of the beginner lessons. Each activity opens to a new window.